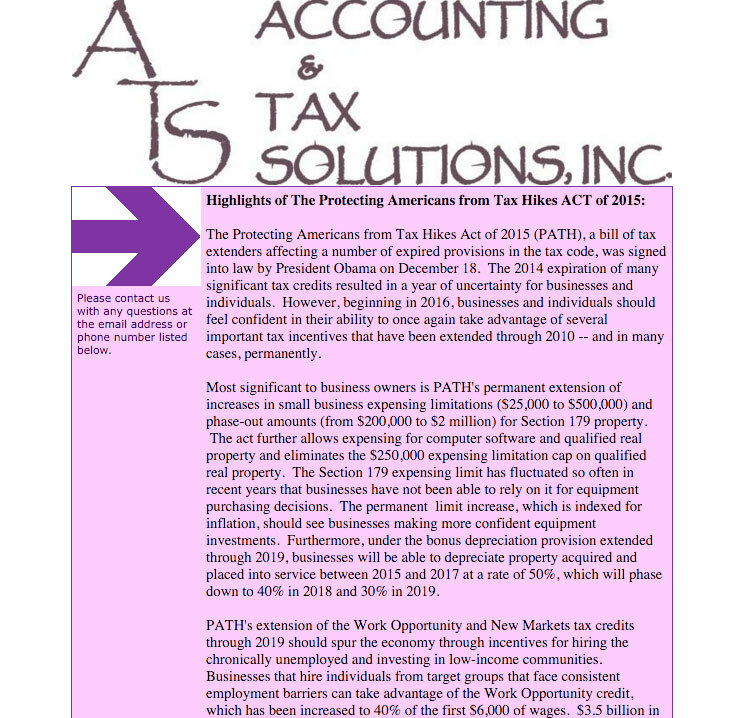 The Protecting Americans from Tax Hikes Act of 2015 (PATH), a bill of tax extenders affecting a number of expired provisions in the tax code, was signed into law by President Obama on December 18. 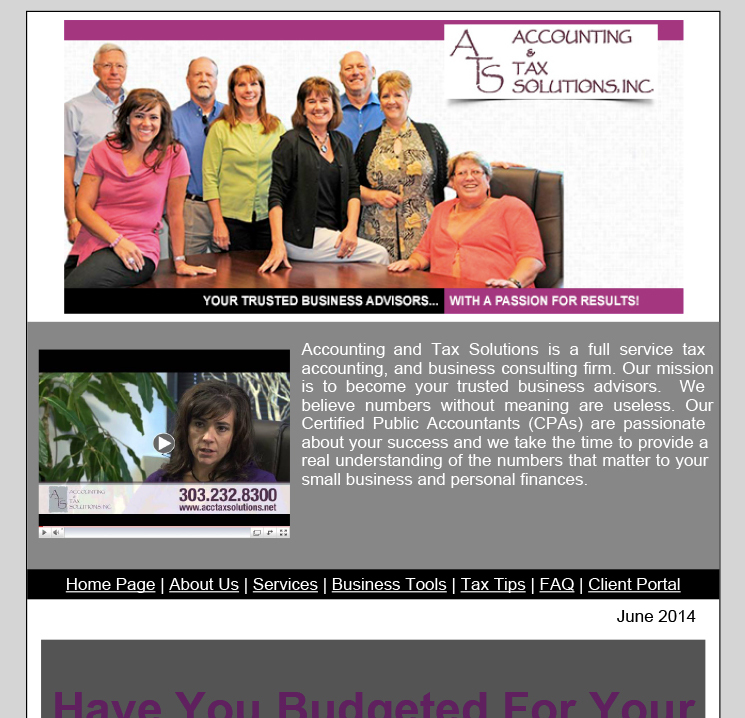 The 2014 expiration of many significant tax credits resulted in a year of uncertainty for businesses and individuals. However, beginning in 2016, businesses and individuals should feel confident in their ability to once again take advantage of several important tax incentives that have been extended through 2010 — and in many cases, permanently. 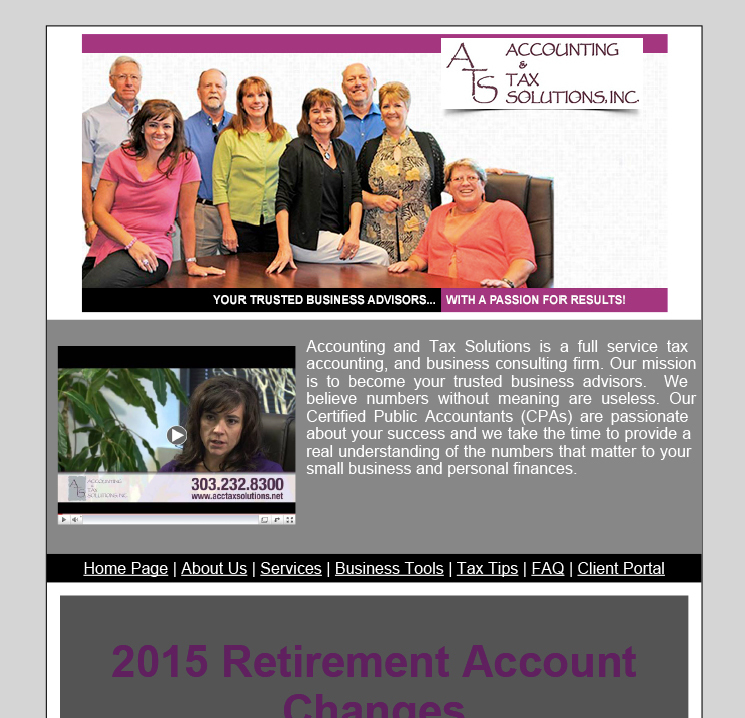 ATS makes finding and accessing tax information quick and easy. 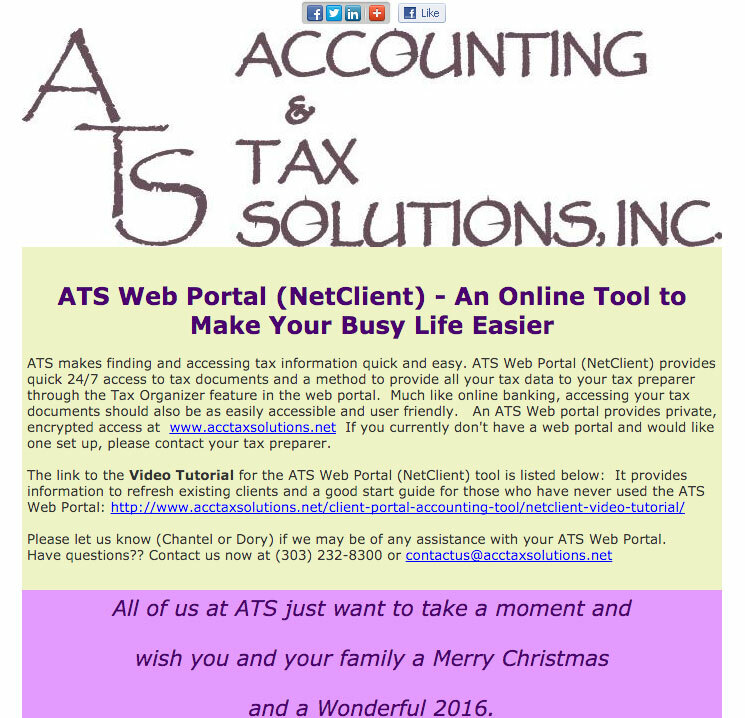 ATS Web Portal (NetClient) provides quick 24/7 access to tax documents and a method to provide all your tax data to your tax preparer through the Tax Organizer feature in the web portal. Much like online banking, accessing your tax documents should also be as easily accessible and user-friendly. 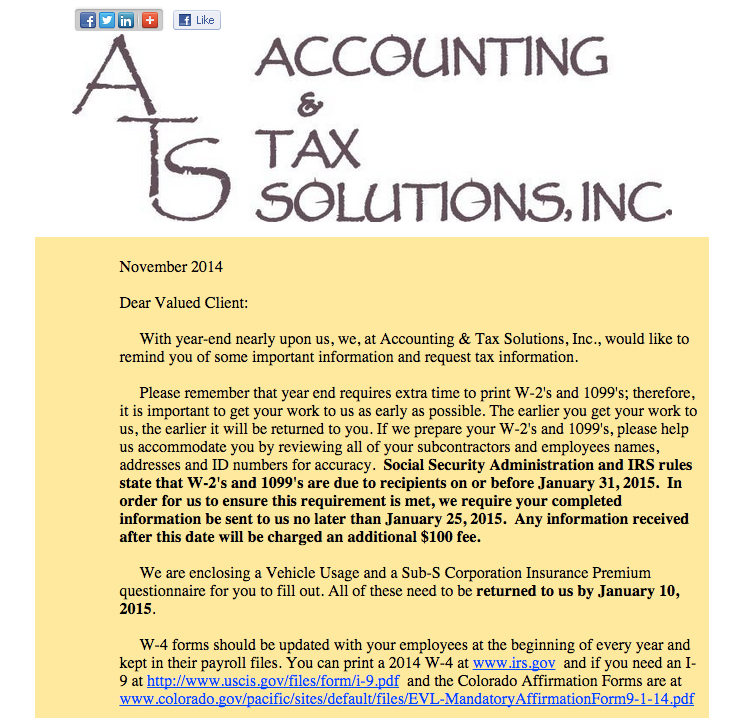 An ATS Web portal provides private, encrypted access at www.acctaxsolutions.net If you currently don’t have a web portal and would like one set up, please contact your tax preparer. 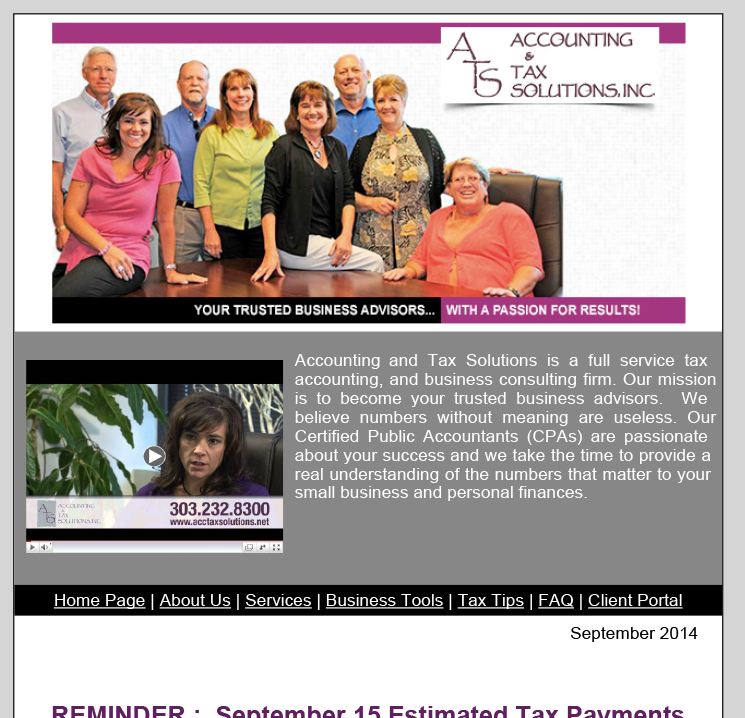 With year-end nearly upon us, we, at Accounting & Tax Solutions, Inc., would like to remind you of some important information and request tax information. Please remember that year end requires extra time to print W-2’s and 1099’s; therefore, it is important to get your work to us as early as possible. The earlier you get your work to us, the earlier it will be returned to you. If we prepare your W-2’s and 1099’s, please help us accommodate you by reviewing all of your subcontractors and employees names, addresses and ID numbers for accuracy. If you still rely on snail mail to pay your federal taxes, think about trying a new approach: paying electronically. Among the options is a web-based system, launched this year, known as “IRS Direct Pay.” You can use it to zap your individual federal tax bills or estimated tax payments directly from your bank account. That might not sound so smart to readers fearful of hackers or other cyberspace hazards. However, growing numbers are trying the program. Nearly 800,000 tax payments totaling almost $1.6 billion have been received from individual taxpayers since Direct Pay made its debut earlier this year, says Eric Smith, an IRS spokesman. Have you made sure you’ve budgeted and saved appropriately throughout the year to afford your dream vacation this summer? A good rule of thumb to follow while saving for a trip is to ensure you have enough money for a solid week of spending and meals, as well as a safety net to cover any potential mishaps.